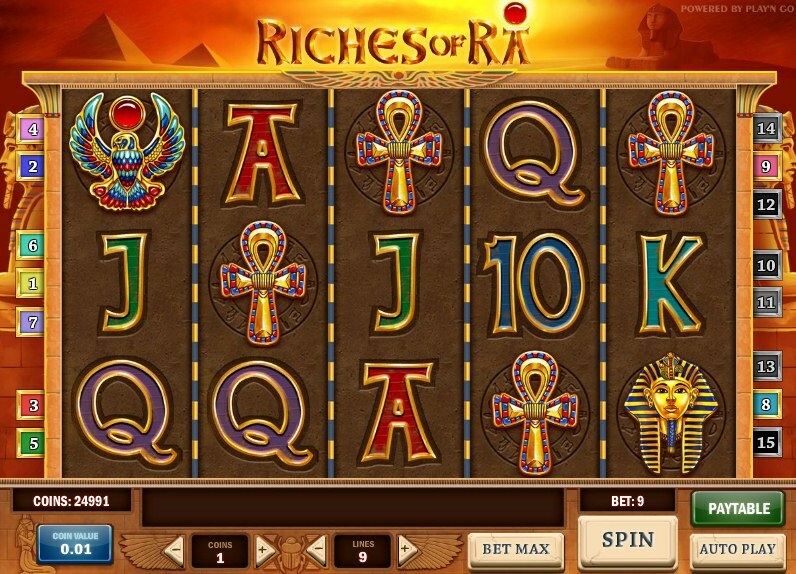 Riches of Ra is a 5 reel, 15 pay-line slot that has a theme based on the Egyptian Sun God called Ra who has become a familiar name in online slots such as Novomatic’s Egyptian themed Book of Ra Deluxe. It is one of the most popular slot releases to come from the brains of online slot developer Play ‘n’ Go with the developer starting to become a globally recognised brand after its merge deal with Jadestone back in 2010. Symbols in the game are all based on Egyptian archaeology including a Scarab, Sphinx and an Egyptian Winged Goddess. Ra represents the Wild symbol and he will substitute for all other symbols except for the scatter symbols to complete winning combinations. If you are lucky enough to hit stacked Wild symbols on reels 1 and 5 then you will trigger the free spins bonus round which will see you be awarded with 15 free spins immediately. Throughout the free spins the stacked Wild symbols covering reels 1 and 5 will remain static giving you a fantastic opportunity to hit some big winning combinations during the free spins. There is also the chance to trigger the Pick and Choose Urns Bonus when you hit three or more Urn scatter symbols across the reels. Once triggered, you will be presented with a choice of urns that you must then select from to reveal a prize. 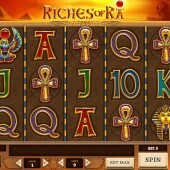 Riches of Ra might not storm the slots genre but it is a fun slot that gives you the potential to win some great prizes with the stacked Wilds and free spins. There is nothing too inventive in this slot with standard features and the features are tough to trigger. However, the wins once you trigger the features can make the wait worthwhile but that does depend on how long you have to wait. Not a bad slot release for a relatively young developer that still has more to offer the slots genre with upcoming releases.